Yesterday, the Federal Reserve tweaked interest rates upward one more time, "to raise the target range for the federal funds rate to 3/4 to 1 percent." Most of the commentary has focused focuses on the macroeconomics of whether or when rates should rise, which seems appropriate. But spare a thought for those, including retirees, insurance companies, and pension funds, who depend on investments that make interest payments as part of their portfolio. 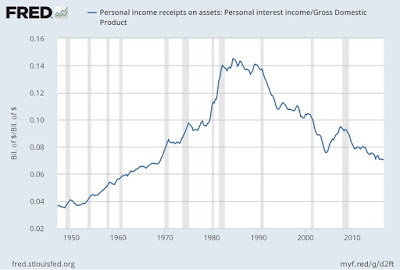 One obvious consequence of the low interest rates in recent is that personal income received in the form of interest payments has also declined. 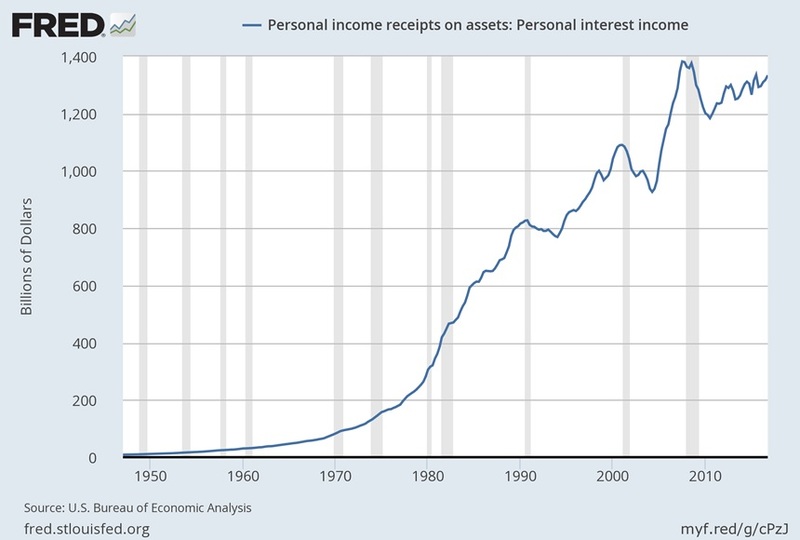 Here's a figure showing personal interest income received since the 1950s. The drop in interest payments received as personal income after the Federal Reserve cut interest rates to fight recession in 2001, and again in 2007-2008, are clearly visible. The hump-shaped curve is striking to me. 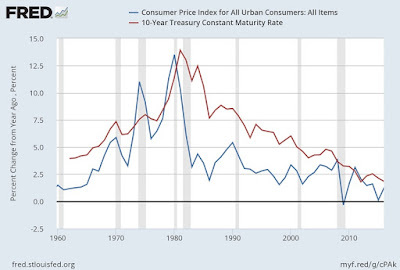 Back in the late 1940s, the main task of the Federal Reserve in the aftermath of World War II was to keep interest rates low so that government interest payments on the wartime debt would stay affordable. But the Fed broke lose from this arrangement and regained its independence with what is sometimes called the Treasury-Fed Accord of 1951. Interest rates rose, and so did the quantity of financial instruments paying interest, so the personal income received in the form of income rose, too. The 1980s were a peculiar time for interest income. The blue line in the figure below shows the annual inflation rate. The red line shows an interest rate commonly used as a benchmark for the overall level of interest rates, the interest rate on 10-year Treasury bonds. 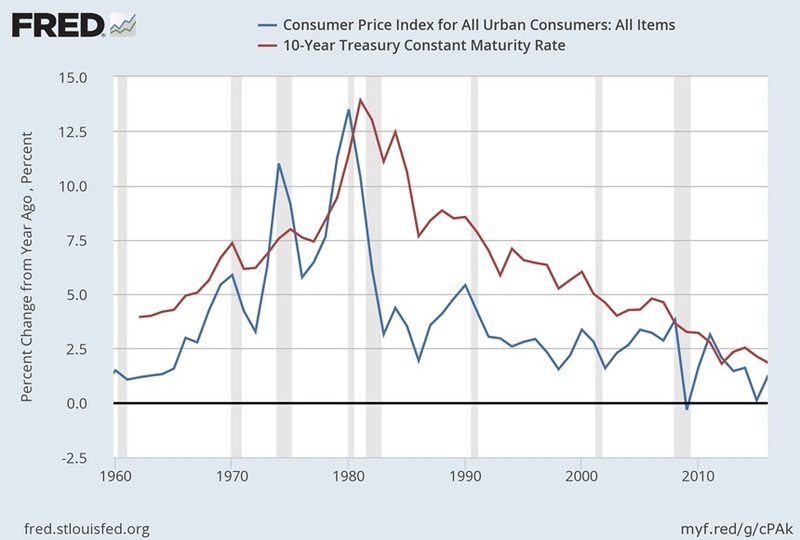 High inflation during the 1970s had pushed nominal interest rates way up. The drop in inflation around 1983 came more suddenly than many had expected, and so there is a period when the real rate of return on many interest-bearing investment (that is, the gap between the red and the blue line) was unexpectedly high. 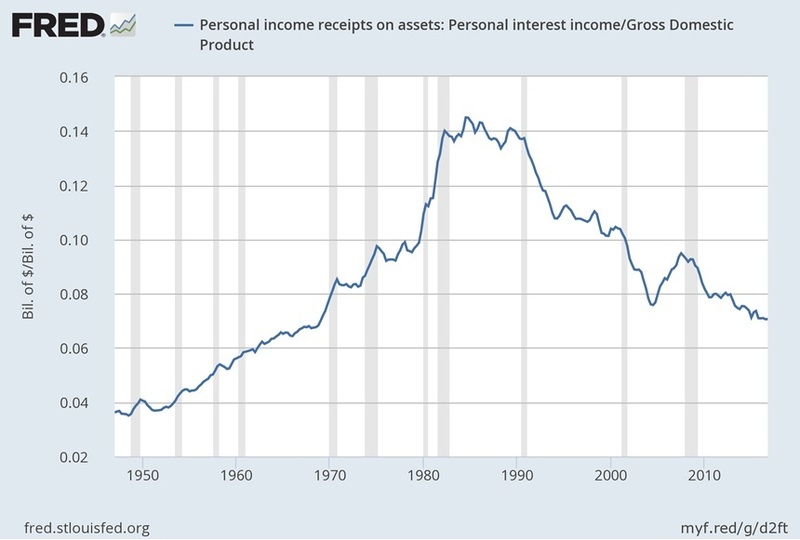 During that period in the mid-1980s, personal income from interest payments was historically high relative to GDP. 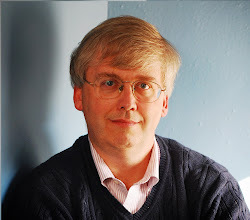 But since then, interest rates have gradually drifted lower, and during a number of time periods, the returns available from alternative investments in the stock market looked quite attractive. 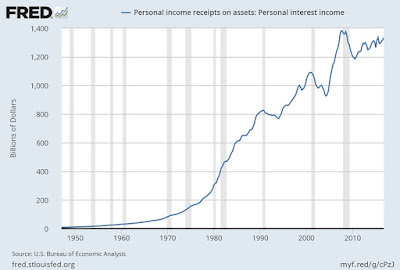 Personal income received in the form of interest payments has drifted lower, although not yet back to the level of the 1950s. India: What's Needed for Sustained Growth? What's the Value of US Household Production?